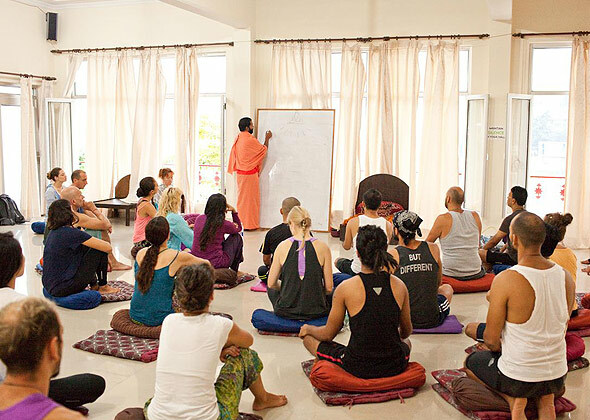 Shiva Yoga Peeth offers 300 Hour Advanced Yoga Teacher Training program. Join our Yoga Alliance International approved school for advanced multi-style Hatha and Ashtanga 300 hour Yoga Teacher Training courses for their 500 hour certificate. 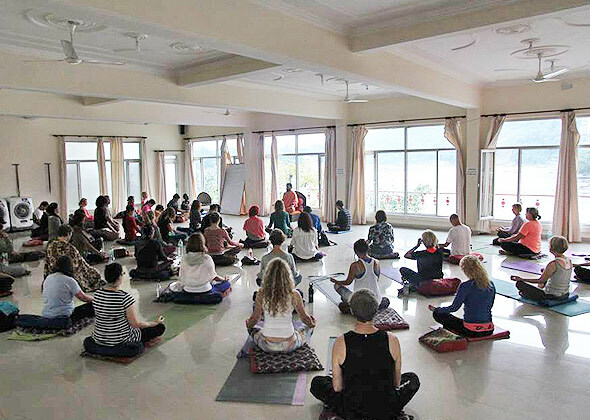 This advanced course is wonderful for students of all levels as well as for teachers who have completed their 200 Hour Yoga Teacher Training either at Shiva Yoga Peeth or another certified facility. 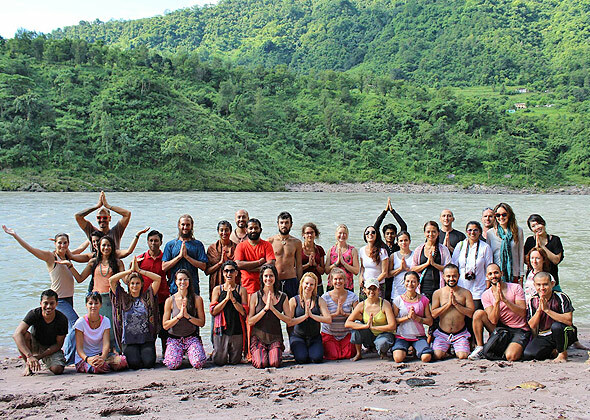 Our 300 hr Yoga Teacher Training Course (YTTC) is a 4 week intensive program of study designed to deepen your already existing knowledge and foundation of Yoga. Students must have already completed a 200 hr Yoga TTC in any style in order to enrol as a student and prepare you for a more advanced personal and professional investigation into the transformative power of yoga: in body, mind and soul. The body is a stunning expression of geometry and taking your knowledge of alignment to an advanced level will enable you to work with new and advanced students alike in a far more specific way. The electives offered in this major will allow you to refine your eye, offer profound and dynamic adjustments, and targeted modifications for students working with injures and other limitations. You will also learn to use props to support students at all levels of practice to reach a much deeper understanding of each pose. *The 500 Hour Yoga Training Course Curriculum is a combination the 200 Hour Yoga Teacher Training Course Curriculum and the 300 Hour Course Curriculum. Syllabus may change according to the situation. 300 hour students will learn more than 100 attractive traditional and dynamic Hatha yoga Asana poses. Every morning 2 hour Hatha,Vinyasa,Partner yoga etc. and evening 2 hours AshtangaVinyasa and an hour of stretching adjustment and alignment classes with detail technique by our experienced teachers. E. Ashtanga Vinyasa Yoga – With all details. Vinyasa Flow yoga is called such because of the fluid balance between the breath flow and body movement. ‘Vinyasa’ means breath-synchronized motion and this style of yoga places as much emphasis on the yoga postures as on the transition between the asanas—creating a dynamic, flowing yoga class that transforms into a playful dance between body and breath. Vinyasa is a term that covers a broad range of yoga classes—but all styles of Vinyasa incorporate the same quality of movement with breath—whether a more dynamic Power Vinyasa class, or a Gentle Flow yoga. Vinyasa allows the teacher a lot of variety and space for creativity, and the opportunity to develop their own personal voice and style as a teacher. There are no standard sequences to be followed or taught but will almost always include many variations of sun salutations. Expect lots of dynamic movement, not just static stretching. This style of asana evolves into a meditation in motion, moving with mindfulness and allowing the body to become active and the mind to quiet and focus. Jala Neti – Process for purifying nasal area. Sutra Neti – Process for purifying nasal area in advance way. Dhauti (Vamana) -Chain of processes for purification for the whole alimentary canal. Sankha Prakhalana – A complete wash of alimentary canal. Trataka–Process of intense and deep concentration on a subject. This increases the power of concentration. It develops the dormant inherent spiritual powers in every person. It gives power to eyes. Mental steadiness increases and restless mind becomes peaceful. Types of Meditation– Scientists usually classify all types of meditation, depending on the way they focus attention, into two categories: Focused Attention and Open Monitoring. I’d like to propose a third: Effortless Presence. Focusing the attention on a single object during the whole meditation session. This object may be the breath, a mantra, visualization, part of the body, external object, etc. As the practitioner advances, his ability to keep the flow of attention in the chosen object gets stronger, and distractions become less common and short-lived. Both the depth and steadiness of his attention are developed. OM yogic meditationsThere is not one type of meditation which is “Yogic Meditation”, so here it is meant the several meditation types taught in the yoga tradition. Yoga means “union”. Tradition goes as far as 1700 B.C, and has as its highest goal spiritual purification and Self-Knowledge. Classical Yoga divides the practice into rules of conduct (yamas and niyamas), physical postures (asanas), breathing exercises (pranayama), and contemplative practices of meditation (pratyahara, dharana, dhyana, samadhi). Chakra Meditation – the practitioner focuses on one of the seven chakras of the body (“centers of energy”), typically doing some visualizations and chanting a specific mantra for each chakra (lam, vam, ram, yam, ham, om). Most commonly it is done on the heart chackra, third eye, and crown chackra. Gazing Meditation (Trataka) – fixing the gaze on an external object, typically a candle, image or a symbol (yantras). It is done with eyes open, and then with eyes closed, to train both the concentration and visualization powers of the mind. After closing the eyes, you should still keep the image of the object in your “mind’s eye”. Kundalini Meditation – this is a very complex system of practice. The goal is the awakening of the “kundalini energy” which lies dormant on the base of the spine, the development of several psychic centers in the body, and, finally, enlightenment. There are several dangers associated with this practice, and it should not be attempted without the guidance of a qualified yogi. Kriya Yoga – is a set of energization, breathing, and meditation exercises taught by Paramahamsa Yogananda. This is more suited for those who have a devotional temperament, and are seeking the spiritual aspects of meditation. Sound Meditation (Nada Yoga) – focusing on sound. Starts with meditation on “external sounds”, such as calming ambient music (like Native American flute music), whereby the student focuses all his attention on just hearing, as a help to quieten and collect the mind. By time the practice evolves to hearing the “internal sounds” of the body and mind. The ultimate goal is to hear the “Ultimate Sound” (para nada), which is a sound without vibration, and that manifests as “OM”. Acquire deeper knowledge of Yogasanas, Pranayama, Meditation, Philosophy, and Anatomy. Enhance your teaching skills and brush up on your Sanskrit, asana vocabulary, and adjustment techniques. Refresh your knowledge of anatomy and philosophy in a focused, committed learning environment with professional and dedicated teachers. Deepen your own personal asana practice with daily Vinyasa Flow classes, advanced asana practice like arm balances and backbends. Learn and practice hands-on adjustments and enhance your teaching skills. Share the knowledge and experience you have gained as a yoga teacher with others. Take some personal time for yourself and ENJOY BEING A STUDENT AGAIN—studying in a fun, encouraging, and supportive environment. Enhance your credibility and increase your visibility. The philosophy component will follow a more in-depth study of Chakras and Bhagavad Gita, apart from basics of Ayurveda. Students will study intense pranayama, chakra balance, metaphysical meditations, and Yoga Nidra. The Anatomical highlight will be on practical applications of anatomy and comparative anatomy. Vinyasa Flow yoga is called such because of the fluid balance between the breath flow and body movement. ‘Vinyasa’ means breath-synchronized motion and this style of yoga places as much emphasis on the yoga postures as on the transition between the asanas—creating a dynamic, flowing yoga class that transforms into a playful dance between body and breath. Vinyasa is a term that covers a broad range of yoga classes—but all styles of Vinyasa incorporate the same quality of movement with breath – whether a more dynamic Power Vinyasa class, or a Gentle Flow yoga. This will lay the groundwork for creating effective class plans for a variety of purposes. You will write a sequence for each day of this training as we explore and unpack a variety of teaching and sequencing strategies. “Say what you mean, mean what you say.” Refine your use of language so that every word conveys your meaning. Increase the skill and efficacy of your use of touch. We will explore considerations of when to touch, whom to touch and how to touch, as well as different types of physical adjustments in a variety common poses. Practice techniques and alignment for approximately 80 most popular intermediate and advance postures including arm balances, inversions, standing postures, backbends and forward bends. Modifications, other variations and advance variations of all postures. How to use yoga props like blocks, bolsters, straps, blankets, and walls in your yoga practice. Observation by main teachers on your personal practice and feedback everyday immediately after the main asana class. Daily hands-on-adjustments are given to students by expert teachers or by fellow trainees to deepen your own physical practice. One of the main asana teachers will be making observations about your personal practice and alignment during main asana classes in the morning. The feedback based on these observations will be given to you immediately after the class so that you can take the help of the teacher to correct your alignment or choose the suitable modification or variation. The teachers will suggest to you the necessary corrections in your practice. We do this to make sure that you practice with correct techniques and alignment from day one so that you can improve and deepen your practice every time you hit the mat; so that when you leave the course you have advanced your practice and knowledge of alignment to a much higher level than you came with. Introduction, its aspects, pranic body, different types of prana, types of breathing, anatomy of breathing, Yogic breathing, Nadi Shodhana (alternate nostril breathing), Sheetali (cooling breath), Shitkari (hissing breath), Bhramari (humming bee breath), Ujjayi (the psychic or victorious breath), Bhastrika (bellows breath), Kapalabhati (frontal brain cleansing breath), Suryabheda (vitality stimulating breath) including advance variations. Introduction, types, Hand mudras, Postural mudras, Lock (bandha) mudras, Jnana mudra (psychic gesture of knowledge), chin mudra (psychic gesture of consciousness), Shambhavi mudra (eyebrow center of gazing), Nasikagradrishti (nosetip gazing), Khechari mudra (toungue lock), Shanmukhi mudra (closing the seven gates), Vipareetkarani (inverted psychic attitude), MahaMudra (great psychic attitude). Introduction, types, throat lock, root lock, abdominal lock, great lock Kriya; Yogic cleansing techniques: Nasal cleansing (neti), frontal brain cleansing (kapalabhati), and eye cleansing-candle gazing (trataka). Includes both human physical anatomy and physiology (bodily systems, organs, etc.) and energy anatomy and physiology (chakras, nadis, etc). Includes both the study of the subject and application of its principles to yoga practice (benefits, contraindications, healthy movement patterns). Includes practice teaching, receiving feedback, observing others teaching, hearing and giving feedback. Also includes assisting students while someone else is teaching. You will have an opportunity to teach your fellow mates. Regular feedback are given by teachers and fellow students about your teaching so that you can improve and find your unique voice and style as a teacher. You will learn to give hands on adjustment and practice the same on alternate days on your fellow students.